UNO’s hockey team hosted the Northern Michigan Wildcats this past Friday and Saturday, November 24th and 25th, in Omaha at Baxter Arena. Approximately 5,000 fans showed up to the game the day after Thanksgiving, and UNO did not disappoint. Just two minutes into the first period, Omaha’s Tristan Keck was assisted by Ryan Galt for an easy goal to give the Mavericks their first lead of the night, 1-0. The Wildcats would fight back, Phillip Beaulieu of Northern Michigan evened the score 1-1 with about 11 minutes left in the first period. Both teams also had their own power play opportunities in the first, but came up empty handed. The Wildcats were the first to strike in the second period, Joseph Nardi came away with a goal of his own to give Northern Michigan a 2-1 lead just one minute into the second. UNO’s persistent offense would keep them in the game though, the Mavs’ Tyler Vesel was assisted by Jordan Klehr for a beautiful goal to tie it up again at 2-2. A couple minutes later UNO began pouring it on, first it was Zach Jordan and then it was Luke Nogard. Both players managed to get a goal before the second period ended to put the Mavs up 4-2 at the start of the third. UNO’s defense kept the Wildcats under control for the rest of the game, they gave up only one goal in the third period with four minutes left in the game to make the score 4-3. 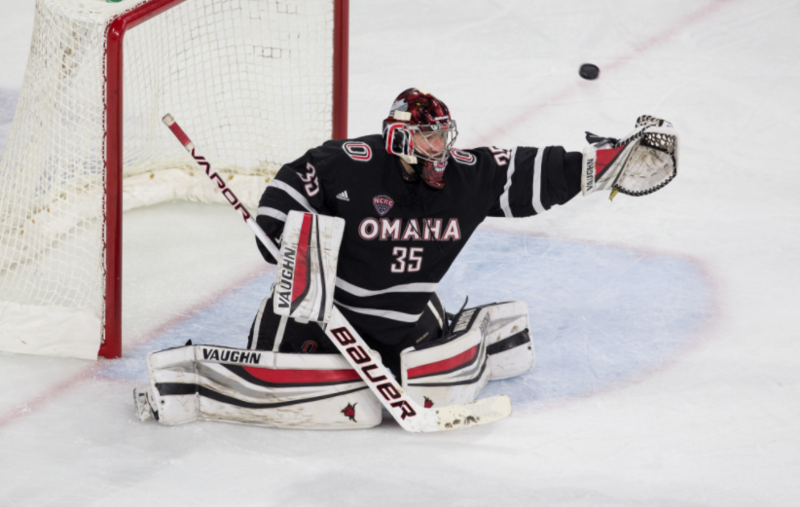 Although the Wildcats had hope, UNO left Baxter Arena Friday night with a 4-3 win. The teams faced off again on Saturday for their second matchup of the series and UNO would once again show out for the home crowd. Only 34 seconds into the game, UNO’s David Pope got his first goal of the season to make the score 1-0 after being assisted by Fredrik Olofsson. Two minutes later Luke Nogard scored a goal for the second straight night, expanding the Mavs lead to 2-0 early. The second period began with the same 2-0 score, UNO’s defense was stellar throughout the first period. The Mavs continued their hot start, making the lead 3-0 off the stick of unassisted Teemu Pulkkinen only two minutes into the second. Zach Jordan scored another goal for the Mavericks late in the second period, giving UNO a huge 4-0 advantage. The Mavs defense would try for the shutout but came up just short, Philip Beaulieu of Northern Michigan scored a goal with 46 seconds remaining in the game to try and numb the pain. The final score of Saturday’s matchup was 4-1 in favor of the Mavericks. The Mavs are now 6-5-1 on the season and will prepare for a conference matchup next weekend. UNO will be hosting St. Cloud State this upcoming Friday and Saturday, December 1st and 2nd, at Baxter Arena and look to improve their 1-3 conference record.